This game has nothing to do with jazz. 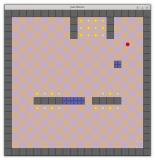 Rather, it was inspired by the old "JezzBall" and "Maxwell's Maniac" games from the Microsoft Entertainment Pack. 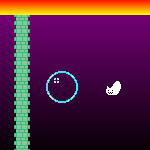 Guide the bouncing ball so it rolls over all the coins. Once all the coins have been collected, the exit opens up. Bring the ball to the exit to progress to the next level. You can drag the blue squares with the mouse. They are useful for guiding the ball toward or away from different areas. You can even use them to completely block off certain areas. Brown squares disappear when the ball hits them. Don't let the ball hit the spikes. 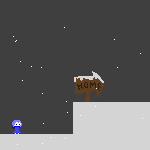 A simple little game where a ninja pushes blocks around. This is inspired by my previous game, Gridball. 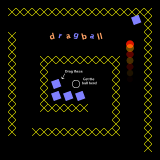 As the ball in this game moves at a fixed speed in only cardinal directions, you have to prevent it from hitting the dangerous terrain by dragging nearby bricks into its path. But when it hits a brick, it turns 90 degrees and destroys the brick, so you'll need to deploy them carefully and quickly! get out there and cause maximum carnage! It's like you live in the world of Tetris. Also, you're going to die.